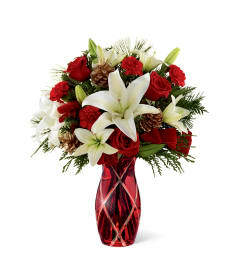 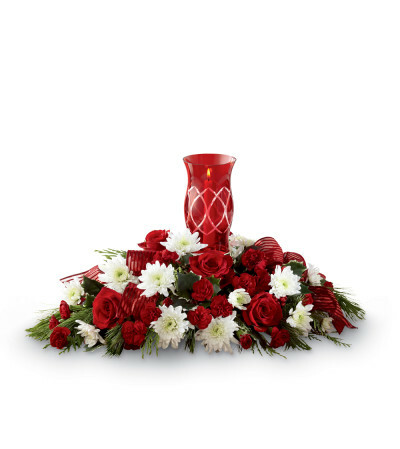 The FTD® Celebrate the Season™ Centerpiece offers the warm glow of Christmas beauty to grace your special recipient's table at their holiday gatherings. 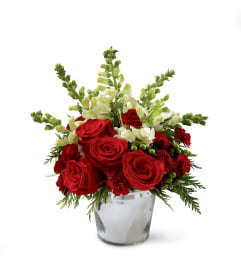 A collection of beautiful blooms including rich red roses, burgundy mini carnations and white chrysanthemums are elegantly arranged with lush holiday green accents, variegated holly stems and a designer red ribbon. Surrounding a designer red cut glass hurricane candle holder with a single taper candle at the center, this exquisite holiday fresh flower arrangement will be the perfect way to help them deck the halls with holiday cheer, bringing joy and grace to all of their festivities.